OP/ED: Do We Really Want Our Energy Sector to Come Back – Ever? This op-ed, by Chris Gardner (President, ICBA), originally ran in The Financial Post on July 26, 2017. It’s not easy doing business in Canada. Just ask Kinder Morgan. For years, Kinder Morgan worked to “Get to Yes” on its plan to expand the Trans Mountain pipeline. They met with Indigenous communities, with municipalities, with businesses, with politicians, with NGOs, and with concerned citizens. They saw new governments rise – Rachel Notley in Alberta, Justin Trudeau in Ottawa – and after years of effort, and a 29-month independent review by the National Energy Board, Trans Mountain got its “Yes,” subject to 157 environmental and technical conditions. The project was then approved by Prime Minister Trudeau. The B.C. government followed suit, adding another 37 conditions. For Canadians worried about the risks of an oil spill, 194 conditions plus a commitment by the federal government to invest $1.5 billion to protect our coast line, should provide comfort that no jurisdiction in the world brings its natural resources to market as safely as Canada. Desjardins, the biggest credit union group in the country, announced earlier this month that it would stop funding pipeline projects in Canada. This shift in policy could impact not only Trans Mountain but also other important pipeline projects. Desjardins was pressured by radical activists who oppose nearly everything about Canada’s energy industry and, given their announcement, Desjardins seems to be throwing in the towel. In a letter to Desjardins that included the signatures of 11 American groups, plus three from Europe, the activists were dead wrong on number of key points – that Alberta’s oil industry is “massively destructive” (it isn’t), that Trans Mountain “abuses” Indigenous people (it doesn’t), that it will make our iconic orcas go extinct (it won’t), that pipelines have too many leaks already (they don’t), and that the Fraser River will be damaged (it won’t). The fact that a large Canadian financial institution like Desjardins is buckling to activists who have no interest in an honest debate on Canada’s energy resources, is troubling. The energy sector accounts for a significant part of Canada’s prosperity. More than 425,000 people support their families and communities by working in the oil and gas sector. The industry is the single largest private sector investor in Canada, forecast to invest $44 billion in 2017. That’s equivalent to the entire provincial budget of British Columbia. The energy sector also pays an estimated $15 billion annually to government, ensuring all Canadians share in the benefits. To be sure, there are important issues that need to be independently assessed when considering any large project, but this has to be done within a reasonable timeframe. But once the review is done, the conditions attached, and governments have provided their stamp of approval, projects need to move forward. Anything else would send a dangerous message to businesses and investors. We risk being labelled a place where it is simply too difficult to get things done, or worse, a place where regulatory approvals are not worth the paper they are printed on. The result: businesses and investors taking their ideas, their people and their capital elsewhere. It’s already started. Over the past two years, some of the largest energy companies in the world have passed over Canada for more investor-friendly jurisdictions. The cost to Canada has been billions of dollars in investment and tens of thousands of lost jobs. 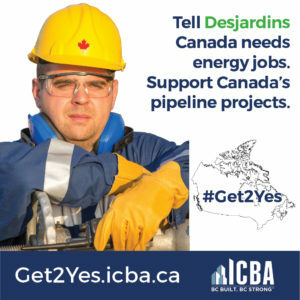 ICBA has launched a campaign asking Canadians to go to Get2Yes.ICBA.ca and send an email to Desjardins CEO Guy Cormier, asking him to reconsider. Maybe hearing from thousands of people across Canada will cause Desjardins to rethink its position. In recent years, ICBA has placed a sizable amount of our group benefit insurance business with Desjardins – given their decision, our business relationship is coming to an end. But this is about more than Desjardins. If we expect the wealth, innovation and investment that flows from harnessing Canada’s rich natural resources to flow as freely as it did before the decline in commodity prices, everyone should be standing up for Canadian energy, Canadian jobs and made-in-Canada decisions that benefit all Canadians.